Joseph Priestley is usually credited for the co-discovery of oxygen. Joseph Priestley (March 13, 1733 – February 8, 1804) was an English chemist, philosopher, dissenting clergyman, and educator. As an educator, he promoted the teaching of history, science, and the arts, advocating curricula that reflected contemporary discoveries. As a religiously motivated but dissenting clergyman, he followed and preached a heterodox version of Christianity that challenged Trinitarian theology. As a chemist, he experimented with several different gases becoming famous for his co-discovery of oxygen, which he called "dephlogisticated air" in his determination to defend phlogiston theory which eventually left him isolated within the scientific community. He also discovered that carbon dioxide could be dissolved in water to produce a pleasant-tasting drink (soda water). He is also remembered for supporting the American colonists against British rule and for sympathizing with advocates of the French Revolution. Joseph Priestley was born on March 13, 1733, in Fieldhead, a village near Birstall, about six miles south-west of Leeds, in Yorkshire, England. His mother died when he was young and he was sent to live with an aunt who was a devout Protestant. He was educated in nonconformist religious schools and excelled in a variety of languages, both classical and modern, including Arabic and Hebrew. He also studied what was then known as natural history. The school he attended, Batley Grammar School, is still in operation, and it now has a section named Priestley House, for children between the ages of two and ten. In 1752, he entered the Dissenting Academy at Daventry, Northamptonshire, under the auspices of Nonconformism, and there his religious views took shape. He became an adherent of Arianism and a fervent abolitionist. In September 1755, he started as a parish minister in Needham Market, Suffolk, though he was not officially ordained until May 18, 1762. Because he stammered, and the parish was neither suited to his heterodox ideas, nor wanting a bachelor for their minister, Priestley was unpopular in his Suffolk parish and ultimately went to Nantwich, Cheshire. He established a private school with 36 students in connection with the church in Nantwich where he preached, and derived his income from that school. He received his LL.D. degree from the University of Edinburgh in 1765. Priestley took a position in Warrington Acadamey in Lancashire, the largest of the dissenting academies in England, as a tutor in belles-lettres (the term "belles-lettres," literally meaning "beautiful" or "fine" letters, refers to literary works, particularly fiction, poetry, drama, or essays, a term once used for literature in general). By this time, his religious ideas had matured to Socinianism, an antecedent of Unitarianism. At Warrington, he associated with other liberal-minded tutors. A sympathetic printer, William Eyres, was willing to publish Priestley's work. It was here that he published his grammar book in 1761 (a remarkably liberal grammar for its day) and other books on history and educational theory. While at Warrington, Priestley developed courses that placed an emphasis on history, science, and the arts. He advocated school curricula that reflected contemporary discoveries, reasoning such an approach would better prepare students for the practical realities of life. He taught anatomy and astronomy and led field trips for his students to collect fossils and botanical specimens. Both modern history and the sciences were subjects that had not been taught in any schools before Priestley. Warrington Academy became the foremost school of its kind in England. On June 23, 1762, Priestley married Mary Wilkinson of Wrexham. Yet, by September 1767, the combination of his finances and her poor health caused him to accept a pastorate in Leeds, where he took charge of the Mill Hill congregation. During his tenure at Mill Hill, he published two political works, Essay on the First Principles of Government (1768) and The Present State of Liberty in Great Britain and her Colonies (1769). In 1769, he offered Remarks on Dr. Blackstone's Commentaries, where he defended constitutional rights of dissenters against William Blackstone. Priestley's house was next to a brewery, and he became fascinated with the layer of dense gas that hung over the giant vats of fermenting beer. His first experiments showed that the gas would extinguish lighted wood chips. He then noticed that the gas appeared to be heavier than normal air, as it remained in the vats and did not mix with the air in the room. The distinctive gas, which Priestley called "fixed air," had already been discovered and named "mephitic air" by Joseph Black. It was, in fact, carbon dioxide. Priestley discovered a method of impregnating water with the carbon dioxide by placing a bowl of water above a vat of fermenting beer. The carbon dioxide soon became dissolved in the water to produce soda water, and Priestley found that the impregnated water developed a pleasant acidic taste. In 1773, he published an article on the carbonation of water (soda water), which won him the Royal Society's Copley Medal and brought much attention to his scientific work. As early as 1766, Preistley met Benjamin Franklin in London, and the association between the two men of science was fruitful, leading the former to methodical explorations of electricity and ultimately to publish a definitive history of electrical research. Later, based on the support of Benjamin Franklin, Priestley was hired by Lord Shelburne as his personal librarian and stayed in that post until 1780. 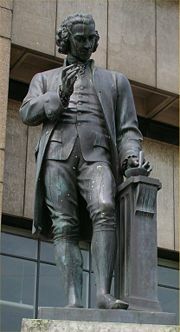 It was here that he conducted the majority of his extensive chemical research, including the discovery of various gases. While tutoring his benefactor's sons at Bowood House near Calne in 1774, he discovered a gas that French scientist Antoine Lavoisier would later name oxygen. Priestley was not yet aware of Swedish chemist Carl Wilhelm Scheele's prior experiments with the same gas sometime before 1775. J.B. Priestley published his findings in the year 1775, in Experiments and Observations on Different Kinds of Air. Later, in 1777, Scheele's discovery was published in his book, Chemical Treatise on Air and Fire. Both Priestley and Scheele were unaware that oxygen was a chemical element. Priestley named the gas (which he had generated by heating red mercuric oxide with a "burning lens") "de-phlogisticated air," in accordance with the phlogiston theory commonly held at the time. Priestley's concept of this new-found "air" (or gas), which dramatically supported and enhanced combustion, was shaped by his attachment to the prevalent "phlogiston" theory. Phlogiston was thought to to be a substance that gave materials their ability to burn. An awkward explanation was offered that somehow this substance (phlogiston) with "negative weight" was released during the burning process and the surrounding air (or gas) must exhibit the capacity to absorb this phlogiston. Priestley accurately observed that the new gas he discovered could support combustion for longer periods than ordinary air. His interpretation was that this gas contained no phlogiston and could thus absorb more of it than could ordinary air. Following this line of logic, he called the gas "dephlogisticated air." In fact, Priestley rated the quality of various airs by their relative ability to absorb phlogiston, among other important properties. Preistley's writings about his discoveries gave the necessary clue that enabled Antoine-Laurent Lavoisier, the French scientist, to recognize the error in Priestley's theory. Lavoisier correctly asserted the gas to be one of the active causes of combustion rather than the receiver of the supposed phlogiston. Lavoisier named the gas "oxygen" and effectively laid the phlogiston theory to rest. Priestley nevertheless defended the outdated theory. Priestley is considered to have been a better experimentalist than a theorist, as is evidenced by the multitude of his observations and creative experiments. Priestley's wide interests and capacity to intuitively sense the interrelationship of previously unrecognized phenomena led him from chemistry to biology with relative ease. He recognized that production of "good air" (later known as oxygen) was related to respiration of plants and that this offset the production of carbon dioxide produced by animals. His observations in this area could be seen as seminal in the development of biological science and the awareness of the interdependence between the animal and plant worlds. "The injury which is continually done to the atmosphere by the respiration of such a large number of animals…is, in part at least, repaired by the vegetable creation." Preistley held the post of librarian to Lord Shelburne from 1772 to 1780, and was able to research and identify other gases including nitrogen, ammonia, nitrous oxide, hydrogen chloride, and sulfur dioxide. This he accomplished by means of an ingenious adaptation of the pneumatic trough, using mercury instead of water in isolating his gases. Priestley's philosophical influence extended beyond his scientific work and included many publications and activities that were considered radical in eighteenth century England. He was involved in controversy over religion and politics. In 1782, he published The History of the Corruption of Christianity, which was officially burned by the Church of England in 1785. He supported the American colonists' war against England and expressed sympathy for supporters of the French Revolution (which broke out in 1789). In 1780, he moved to Birmingham and was appointed junior minister of the New Meeting Society. He became a member of the Lunar Society, but his admiration for the French Revolution caused him to be driven out of the city in the Priestley Riots of 1791. His home and laboratory were burned to the ground by an unruly mob and he fled to London for a time. In London, Priestley received an invitation to become morning preacher at Gravel Pit Chapel, Hackney. His three sons emigrated to the United States in 1793. The following June, when he was 60 years of age, he and his wife followed them, seeking political and religious freedom. Although never naturalized, he lived in Northumberland, Pennsylvania, for the last decade of his life. Joseph Priestley's home in rural Northumberland, Pennsylvania. He became a friend of Thomas Jefferson, among other political figures. An essay written by Priestley in 1768, was used by Jefferson as an inspiration for ideas included in the Declaration of Independence. Priestley quietly passed away on February 6, 1804, while in the presence of his family at home. He is buried in rural Northumberland, Pennsylvania. By the time he died in 1804, Priestley had been made a member of every major scientific society in the Western world and he had discovered numerous substances. The nineteenth-century French naturalist George Cuvier, in his eulogy of Priestley, praised his discoveries while at the same time lamenting his refusal to abandon phlogiston theory, calling him "the father of modern chemistry [who] never acknowledged his daughter." Priestley published more than 150 works on topics ranging from political philosophy to education to theology to natural philosophy. He led and inspired British radicals during the 1790s, paved the way for utilitarianism, and helped found Unitarianism. A wide variety of philosophers, scientists, and poets became associationists as a result of his redaction of David Hartley's Observations on Man, including Erasmus Darwin, Coleridge, William Wordsworth, John Stuart Mill, Alexander Bain, and Herbert Spencer. Immanuel Kant praised Priestley in his Critique of Pure Reason (1781), writing that he "knew how to combine his paradoxical teaching with the interests of religion". Indeed, it was Priestley's aim to "put the most 'advanced' Enlightenment ideas into the service of a rationalized though heterodox Christianity, under the guidance of the basic principles of scientific method." Considering the extent of Priestley's influence, relatively little scholarship has been devoted to him. In the early twentieth century, Priestley was most often described as a conservative and dogmatic scientist who was nevertheless a political and religious reformer. In a historiographic review essay, historian of science Simon Schaffer described the two dominant portraits of Priestley: the first depicts him as "a playful innocent" who stumbled across his discoveries; the second portrays him as innocent as well as "warped" for not understanding their implications better. Assessing Priestley's works as a totality has been difficult for scholars because of his wide-ranging interests. His scientific discoveries have usually been divorced from his theological and metaphysical publications to make an analysis of his life and writings easier, but this approach has been challenged by scholars such as John McEvoy and Robert Schofield. Although early Priestley scholarship claimed that his theological and metaphysical works were "distractions" and "obstacles" to his scientific work, scholarship published in the 1960s, 1970s, and 1980s maintained that Priestley's works constituted a unified theory. However, as Schaffer explains, no convincing synthesis of his work has yet been expounded. More recently, in 2001, historian of science Dan Eshet argued that efforts to create a "synoptic view" have resulted only in a rationalization of the contradictions in Priestley's thought, because they have been "organized around philosophical categories" and have "separate[d] the producers of scientific ideas from any social conflict". Priestley is remembered by the towns in which he served as a reforming educator and minister and by the scientific organizations he influenced. Two educational institutions have been named in his honor—Priestley College in Warrington and Joseph Priestley College in Leeds (now part of Leeds City College)—and an asteroid, 5577 Priestley, discovered in 1986 by Duncan Waldron. In Birstall, the Leeds City Square, and in Birmingham, he is memorialized through statues, and plaques commemorating him have been posted in Birmingham and Warrington. The main undergraduate chemistry laboratories at the University of Leeds were refurbished as part of a £4m refurbishment plan in 2006 and renamed as the Priestley Laboratories in his honour as a prominent chemist from Leeds. ↑ World of Biology (Gale Group, 1999). ↑ Ann Holt, A Life of Joseph Priestley (London: Oxford University Press, 1931). ↑ 3.0 3.1 3.2 Robert E. Schofield, The Enlightened Joseph Priestley: A Study of His Life and Works from 1773 to 1804 (University Park, PA: Pennsylvania State University Press, 2004, ISBN 0271024593). ↑ Qtd. in John McLachlan, Joseph Priestley, Man of Science, 1733-1804: An Iconography of a Great Yorkshireman (Braunton, Devon: Merlin Books, 1983, ISBN 0863030521). ↑ T. E. Thorpe, Joseph Priestley (London: J. M. Dent, 1906). ↑ 6.0 6.1 6.2 Alan Tapper, "Joseph Priestley." Dictionary of Literary Biography 252: British Philosophers 1500–1799. Eds. Philip B. Dematteis and Peter S. Fosl. (Detroit, MI: Gale Group, 2002). ↑ Simon Schaffer, "Priestley Questions: An Historiographic Survey." History of Science 22.2 (1984): 151–83. ↑ Dan Eshet, "Rereading Priestley." History of Science 39.2 (2001): 127–59. ↑ Lutz D. Schmadel, Dictionary of Minor Planet Names (Springer, 2003), 474. ↑ The official opening of the Priestley Laboratories by Lord Sainsbury, University of Leeds, October 20, 2006. Retrieved May 12, 2014. "Joseph Priestley," in World of Chemistry. Gale Group, 1999. Smith, Edgar Fahs. Priestley in America, 1794-1804. Philadelphia, PA: P. Blakiston's Son & Co., 1920. Priestley College, Warrington, named for Joseph Priestley. This page was last modified on 8 June 2018, at 19:36.